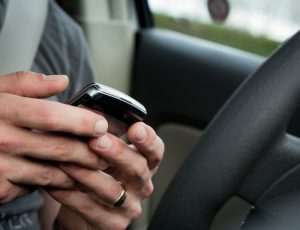 This coming weekend, the Colorado State Patrol (CSP) will be stepping up its enforcement of the laws banning texting and driving by putting more patrols out to specifically look for drivers who may be texting. While these extra troopers will reportedly be stationed throughout the state, CSP has also put up some new roadside signage to alert drivers about this campaign, with signs that specifically state, “Do NOT Text and Drive” and “Get Your Head Out of the Apps” (the latter slogan was borrowed from a CDOT distracted driving campaign). CSP will be focusing on ticketing those who are texting and driving this weekend. Here’s why. Contact us for help with your financial recovery if you’ve been hurt by a negligent motorist. Texting and driving is a factor in nearly 1 in every 4 traffic accidents in the U.S.
Texting and driving is the leading distraction for teen motorists. Teen motorists who text while driving spend about 10 percent of their driving time outside of their lane of traffic. Texting and driving causes at least 11 teens to die in traffic accidents every day in the U.S.
Texting and driving is about 6 times more likely to lead to traffic accidents than drunk driving. When drivers text, their braking reaction times can decrease by as much as 18 percent. Texting and driving is dangerous and illegal. Drivers who continue to text on the roads will be gambling with getting caught and ticketed – and will be putting others at an unnecessary risk of motor vehicle accidents. Have you or a loved one been hurt by a driver who was texting or otherwise negligent? If so, Colorado Springs Car Accident Attorney Kenneth Shakeshaft is ready to advocate your rights, help you recover financially and ultimately help you put your life back together. Since 1982, Kenneth Shakeshaft has been providing people injured in traffic accidents with superior legal service, helping them stand up to insurance companies, large corporations and/or government entities.